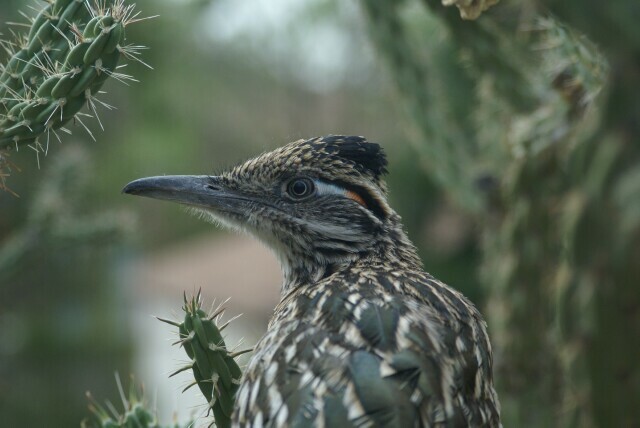 Yesterday I was working on my upper yard project when I heard the familiar raucous call of a roadrunner. I returned the call, and a few minutes later it hopped into the yard not too far from me. I slowly walked up to it, and it flew into a cholla. I repeated the call until I was only a couple of feet away. It seemed agitated, but not overly concerned. I was able to get within a couple of feet of it. I decided to go get the camera. When I returned, it was still in the cactus. I kept getting closer and closer, taking pics the whole time. Boot Kitty appeared and soooo wanted to get the big bird. Fortunately for the roadrunner the kitty realized that the cholla was not a tree and that attempting to climb it would be a painful undertaking. The feline distraction let me get even closer. I snapped a few more pics and then realized that I was only about a foot away. I decided to reach out and touch the little guy. I gently stroked his long tailfeather. I could tell he was a bit freaked out being touched by a human, but I think he knew that I was a better alternative than the cat who was hungrily eying the big tasty bird. I eventually shooed the cat back into the yard and went back to my work. It sat in the cactus for another 15-20 minutes before eventually retreating back to the mesa. Here's a pic of the little guy. like I have posted in the past, I sometimes think my yard could be mistaken for Warner Brothers. Rabbits, roadrunners, and coyotes are frequent visitors.